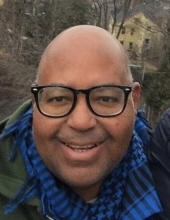 Daniel M. Scott III, 58, died unexpectedly on Friday, April 12, 2019. He had battled multiple myeloma for two years. He is survived by his partner of twenty-five years, James Schlageter, of Providence, RI; his mother, Doris Scott-Martinez; his brother, David Scott; his sister, D’Anna Scott, all of Georgia; and his sister, Daphne Scott-Henderson of California. He also leaves behind an extended family of nieces and nephews, three stepdaughters, and a grandchild. Dr. Scott first joined Rhode Island College twenty-five years ago after earning his Ph.D. in Comparative Literature at the University of Illinois and completing a post-doctoral fellowship at the University of North Carolina-Chapel Hill. He coedited The Collected Writings of Wallace Thurman: A Harlem Renaissance Reader (Rutgers University Press) and has published widely on African-American literature and on gay literature, with essays on Wallace Thurman, Zora Neale Hurston, Rudolph Fisher, Charles Johnson, Walter Mosley, Gerard Barrax, Robert Deane Pharr, Mark Doty, and John Rechy. Other publications include articles on Wole Soyinka, Marlon Riggs, Wilson Harris, André Breton, and Aimé Césaire. He taught for English, Africana Studies, First Year Seminar, and the Honors Program, particularly courses in African American literature, postcolonial literature, Western literature, and non-Western literature. He was long active in the Preparatory Enrollment Program (PEP) and the Dialogue on Diversity at Rhode Island College. He served multiple terms as Director of the Africana Studies Program and was finishing his second term as Chair of the Department of English. Off-campus, he was long an officer of the Rhode Island branch of the ACLU, recently serving as its Treasurer. He was an early board member of Youth Pride and a generous supporter of many organizations that serve local youth, including New Urban Arts and School One. To describe Dr. Scott as much beloved by his family, students, friends, and colleagues is a woeful understatement. He was a genuinely good person who inspired respect and affection in everyone he met. No other person could be as witty, wry, and brilliant while still being so incredibly kind and humble. He never dominated a room, but his presence always sustained and enhanced conversation. Warm, welcoming, calming, sincere, empathetic are all adjectives that describe Daniel. He was also amazingly knowledgeable about a huge variety of topics, which made him a sought-after teammate for department trivia nights and our favorite Jeopardy! contestant of all time. Calling hours will be Wednesday, April 17, 4-7 pm at Monahan Drabble Sherman Funeral Home, 230 Waterman St., Providence. The burial service will be private. All are invited to a celebration of Daniel Scott’s life and a tribute to his career at Rhode Island College, Alger Hall 110, on Friday, April 19, at 2 pm. To send flowers or a remembrance gift to the family of Daniel M. Scott, III, Ph.D, please visit our Tribute Store. "Email Address" would like to share the life celebration of Daniel M. Scott, III, Ph.D. Click on the "link" to go to share a favorite memory or leave a condolence message for the family.